NETWORK FINALS: There were no changes from the preliminary Sunday ratings. CABLE HIGHLIGHTS: It was a moderately good night for AMC, where FEAR THE WALKING DEAD’s 1.09, while down 0.54 from last week, got there without a WALKING DEAD lead-in, and the season premiere of INTO THE BADLANDS, at 0.45, was similarly down 0.97 from last year but again without a WALKING DEAD lead-in. (FEAR’s rating was up 0.29 from the 2017 season finale, and BADLANDS was down 0.02 from its finale.) Without WALKING DEAD as an anchor, TALKING DEAD fell 0.55 from last week to 0.23. Meanwhile, on HBO, WESTWORLD returned up 0.12 from its 2016 series premiere to 0.89 (remember that only 1/3 of US households have HBO), which was also down 0.13 from its finale, with LAST WEEK TONIGHT down 0.02 to 0.41, SILICON VALLEY up 0.11 to 0.40, and BARRY up 0.04 to 0.23. On Showtime, HOMELAND gained 0.03 to 0.33, and BILLIONS was up 0.04 to 0.23, with THE CIRCUS up 0.02 to 0.05/240K. On Adult Swim, MIKE TYSON MYSTERIES ticked up to 0.51, and BALLMASTRZ 9009 was at 0.37/0.32, compared to last week’s 0.32/0.30. Hallmark’s WHEN CALLS THE HEART jumped a tenth to 0.31. On TBS, DROP THE MIC fell a tenth to 0.23, and JOKER’S WILD was down 0.05 to 0.30. 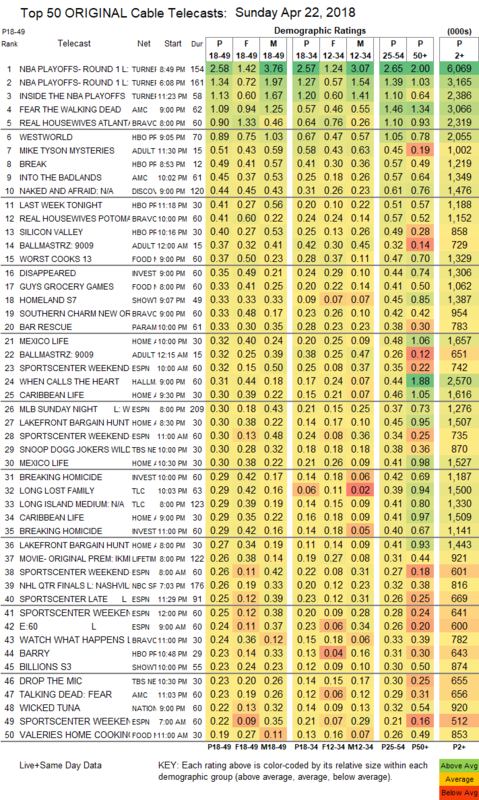 On E!, THE ARRANGEMENT edged up 0.02 to 0.18, and THE ROYALS held at 0.15. FX’s TRUST ticked down to 0.10. 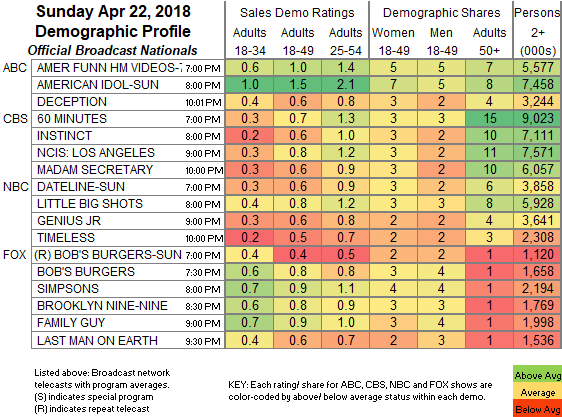 BBCAmerica’s KILLING EVE ticked back onto the chart at 0.08. Starz’s off-chart pair were HOWARDS END, down 0.03 to 0.02/207K, and the now-canceled ASH VS EVIL DEAD, down 0.03 to 0.05/130K. The cable night was actually dominated by TNT’s Cleveland vs. Indiana NBA PLAYOFFS game at 2.58, with the Toronto vs. Washington game at 1.34. On Bravo, REAL HOUSEWIVES OF ATLANTA shed 0.09 to 0.90, REAL HOUSEWIVES OF THE POTOMAC gained 0.03 to 0.41, and SOUTHERN CHARM was down 0.03 to 0.33. Discovery’s NAKED & AFRAID ticked down to 0.44. Food Network’s WORST COOKS IN AMERICA dropped 0.04 to 0.37, and GUY’S GROCERY GAMES was down 0.09 to 0.33. On ID, DISAPPEARED rose 0.09 to 0.35, and BREAKING HOMICIDE was up 0.02 to 0.29. Paramount’s BAR RESCUE climbed 0.09 to 0.33. HGTV’s line-up was led by MEXICO LIFE at 0.32/0.30. On TLC, LONG LOST FAMILY rose 0.09 to 0.29, and LONG ISLAND MEDIUM was up 0.06 to 0.29.